In 1966 Detroit, the lights of the Grande Ballroom stage went up every night on young rockers trying to make a name for themselves. Some failed, but others became some of the most famed personalities in music. Out of nightclubs such as the Grande and the Gold Dollar, Detroit has earned a legacy of producing brash, in-your-face music from the likes of Iggy and the Stooges, Ted Nugent and Bob Seger – music that has shaped the course of rock as we know it. In “Detroit Rock City: The Uncensored History of Rock ‘n’ Roll in America’s Loudest City,” investigative journalist and Detroit native Steve Miller lets the musicians, fans and promoters who put Detroit on the map tell their stories. 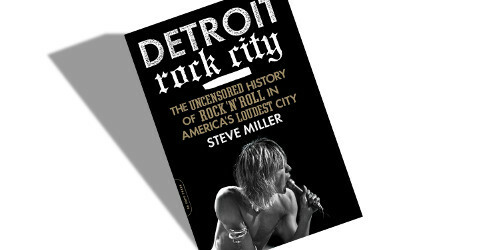 The result of over 200 interviews, Detroit Rock City is an oral history that chronicles the manic and obsessive love affair Detroit had with its music, from the days when acid created a psychedelic music scene to rival San Francisco’s in the ’60s to the garage band scene that produced the White Stripes in the ’90s. Miller will sign copies of his new book at 4 p.m. Aug. 17 at UHF Records in Royal Oak. The book describes the wild underbelly of a working class factory town whose drug-fueled music subculture played hard and partied even harder. Iggy Pop recounts his rise to punk rock fame and inventing the stage dive. Bob Seger describes his first acid trip and reveals who almost made it into The Silver Bullet Band. Alice Cooper remembers how inmates from a hospital for the criminally insane used to listen to the band practice in their barn, explaining that the only reason the song “Dead Babies” made the cut was because the inmates liked it. From the politically charged heyday of the late ’60s when Detroit was a Mecca for all things rock; to the late ’70s when America had lost interest in Detroit’s punk music but the musicians hadn’t; to the ’90s, when Jack White was guitar-slinging and Kid Rock was still a rapper, “Detroit Rock City” expresses the attitude that continues to define American music.